Resources below include a selection of not-for-profit as well as for-profit organizations. Please contact these resources directly for information and/or registration. Welcome to Storybrook Therapy, a counselling practice that recognizes the value in telling our stories. At Storybrook Therapy, we see our stories as gifts — gifts that we have received throughout each season of life and also gifts that we get to share with others. Our stories connect us on this very human journey of ours. Our stories are not to be ignored. Our stories matter. Creation of legacy documents. A legacy document is a written document that allows your life experiences, the lessons you have learned, and your hopes for the future and your loved ones to live on through your own words. Read about the legacy document process on our Services page. Ultimately, creating a legacy document is about allowing the stories that matter most to be shared in your own voice and to future generations. New office space now open! This research project aims to examine family caregivers’ experiences and their health and well-being during palliative care and bereavement post-stroke. By understanding your experiences and those of others like you, we will develop programs to assist future families as their loved one passes away after having a stroke. Your participation in this project involves a confidential, recorded telephone interview that will last approximately 1 hour. You will receive a $25 visa gift card in the mail as a thank you for your participation. If you have provided care for a loved one who had a stroke and passed away within the past 12 months, we are interested in hearing about your experience. One member per family affected by stroke will be accepted into the study. Family members should be 18 years of age or over and speak English. We are interested in speaking with males and females from across Canada. Grieving the loss of a loved one is a time of deep pain and often confusing emotions. Group participants will receive knowledge of how loss affects us and what to expect in the weeks, months, and years ahead. The program facilitators are committed to creating an atmosphere of openness, respect and acceptance. Call St. Mary's Hospital at 780.679.6131 to register, or for more information. 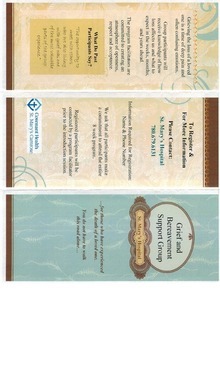 Download "Grief and Bereavement Support Group.pdf"